Product prices and availability are accurate as of 2019-04-25 11:47:17 BST and are subject to change. Any price and availability information displayed on http://www.amazon.com/ at the time of purchase will apply to the purchase of this product. The JBL Clip+ is an ultra-light, ultra-rugged and ultra-powerful portable speaker. 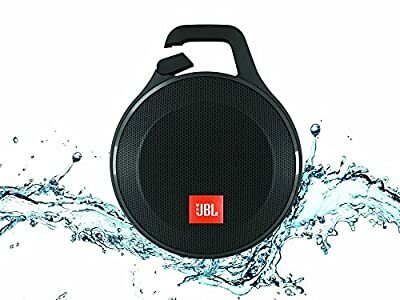 This splashproof upgrade to the JBL Clip+ offers 5 hours of playtime, so you can take your music anywhere you go, over land or water. Stream music wirelessly through Bluetooth, or plug it into any mobile phone or tablet with its incorporated audio cable television. Make use of the speakerphone to make clear, noise and echo totally free call. The JBL Clip+ earns its name with its integrated carabiner, clipping to your clothes or knapsack so you can take pleasure in any experience. Wireless Bluetooth Streaming - Wirelessly stream high-quality sound from your smartphone or tablet. Don't worry if there's no Bluetooth, plug the integrated 3.5mm audio cable into any device and enjoy your music all the same or use it to daisy chain another Clip+ for bigger sound. Speakerphone - Take calls from your speaker with a touch of a button - crystal clear thanks to the noise and echo free speakerphone. Built-in carabiner - Hook the Clip+ onto anything you see fit and take it on all your adventures. Splashproof - Splashproof means no more worrying about rain or spills, you can even clean it with running tap water. Just don't submerge it. Rechargeable Battery - Built-in rechargeable Li-ion battery supports up to 5 hours of playtime.